Nespresso machines are praised as producing some of the best tasting coffee within their category, as well as being handy for time-starved individuals. The range they offer has grown substantially over the past few years, meaning it can be hard for you to choose the one which will best suit your lifestyle and budget as well as giving you the ability to make your favourite type of coffee. We have rounded up and reviewed the ten best Nespresso machines available and picked out their pros and cons to make your decision easier. A machine which will please Nespresso fans and coffee aficionados alike, the Citiz model allows the user to make a vast range of coffee drinks thanks to the integrated milk frother, which many pod machines usually lack. It’s perfect for those who are starting out in the world of coffee machines yet want something with more freedom than the basic models out there. The two water-quantity buttons offer automatic espresso and lungo coffee preparation, but there is also a removable drip tray if you fancy a taller recipe. Prefer to acquire to your particular tastes? Programme the controls to suit, so everything is done at the touch of a button. As it is fitted with an Aeroccino milk frother, you don’t have to separately prepare and add the milk for your lattes or cappuccinos which means a lot less hassle, a quicker brew and more choice. It can heat and froth or just froth, so your cup can be made just how you like it. Fitting the pods can be a bit fiddly, but we saw it’s easy to spot that they aren’t inserted properly before you turn the machine on so it isn’t wasted. It isn’t the best at adapting to different milk types though. We found thinner milk didn’t get frothy enough when poured in up to capacity, and full-fat overflowed if at capacity. Having said that, the user interface is easy to adapt in order to suit everybody’s individual tastes. It switches off automatically after 9 minutes of not being used, which also saves power. For the price, you get a capsule model which rivals some barista-style machines, plus it is compact to suit whatever countertop space you have. It is available without the milk frother, but it is well worth having the option. For anybody who wants to see what all the fuss about capsule machines is without spending a fortune, the Inissia is affordable and takes things back to basics. Firstly, it takes up very little space on the kitchen countertop, so is perfect for any kitchen no matter the size. This does mean the water capacity is on the small scale, but as capsule machines are designed only to create one cup at a time, we found that this isn’t a big deal. You aren’t just limited to using it in your kitchen, either – there is a handle, and it is very lightweight, so feel free to take it on holiday or even just store it away when not in use. It is easy to insert the capsules, and empty ones are collected in a container which is quick to remove and clean out. In fact, the whole machine is easy to clean, so keeping it in top condition is no hassle. The coffee produced tastes high-end, and creating your cup couldn’t be easier. Controlling the quantity of water used is simple, so espressos and lungos are at the touch of a button. We will admit that the instructions provided aren’t the easiest to follow, so there was a lot of guesswork involved for the first few goes, but once you get the hang of things, you wonder how you ever even struggled. After 9 minutes of being left in idle, the machine will turn off to save electricity, but it is easy to get up and running again with a heating time of under 25 seconds. You get 16 Nespresso Grands Crus capsules with your purchase so that you can get started straight away. Make sure they’re inserted properly, or they can easily get stuck or fall through without being pierced. Pod machines are convenient, but often don’t give you the full barista experience or much adaptability. This is where the Creatista Plus steps up to the task while providing a style statement. Firstly, there are three coffee volumes available from 25 to 150ml, so espressos are just as easy to make as standard coffee or lungo, without any need to change settings. Then, there is a milk frother built-in – but it isn’t just any milk frother. Choose the ideal temperature from 56 to 76°C, as well as one of the eight milk frother settings (from 2 to 30 mm). So whether you like your coffee tepid and strong, or hot and milky, everything is adaptable. The milk is frothed in a dedicated stainless steel jug, so if a bit of latte art is your thing, the pour spout allows it. We loved the fact that there are eight beverage selection options too, with three black coffee options, four milk-based and the milk froth. The display also guides you through the steps for the selected coffee type, so even if you are crafting your very own Latte Macchiato for the first time, the instructions are there for you to read clearly. The screen can also guide you through the cleaning and maintenance process, which is great as it looks like a complicated piece of kit on the outside but breaks it all down. This is all without mentioning one of the most significant selling points; the super-fast 3 second heat time. In fact, it is so fast that it took us all by surprise for the first few start-ups. Waiting the average 25 seconds it takes other machines to heat up isn’t a massive strain, but until you have such a quick machine, you don’t know just how great it is. Love the idea of a pod machine but worried your favourite lattes and cappuccinos would take too much effort to craft? The Lattissima Touch, with DeLonghi’s patented automatic cappuccino system, is your answer. Nespresso machines with Aeroccino’s aren’t necessarily rare, but this one seems to have a bit of an edge as it does it all with no input from you. The inbuilt milk container gives you the option to vary your froth texture, and there are six recipes ready to be made at the touch of a button. If you use alternative milk, such as soya or almond, you’ll be pleased to hear it handles them with no difficulty, unlike with a lot of other milk machines. The container is removable and can be popped in the fridge if you want to prepare some milk ahead, make a hot chocolate with powder or use it cold, and the machine reminds you to clean it after every use, so it is all very hygienic. A handy light comes on when everything needs cleaning and descaling, and all the steps must be followed meticulously for the light to turn off. While this is technically great for keeping everything in top condition, it can make it a bit of a long process, and it had a habit of starting from the beginning if we didn’t move it to the next step quickly enough. We found it was a bit louder than most of the other Nespresso machines we reviewed, especially when frothing milk, but it is something you soon get used to. Also, you may have to preheat the cup with boiling water if you don’t want to have to gulp it all down as the temperature of the coffee produced isn’t the hottest. For something small yet powerful, the Pixie lives up to its name. The compact dimensions make it perfect for kitchens of all sizes, whether you are low on space or simply don’t want a machine that takes up a lot of room. It comes in at slightly smaller than the Inissia but with an arguably sleeker design thanks to the aluminium side panels. The two one-touch buttons offer espresso and lungo sizes, but you can reprogramme the water length of both options to suit your individual tastes and how strong you want the coffee to be. Thanks to the folding cup tray, you can adapt any size of cup or glass, too. We liked the ‘empty water tank’ alert, where the back of the machine illuminates in red to say it needs filling up. The capacity is 0.7L, which is enough to do around 8 cups, but it can be easy to turn it on without checking so the light is beneficial. The used container holder has a capacity of around 9-11 capsules too, so if you’re having a lazy day and don’t want to clean it just yet, you are safe. When the time does come, cleaning it all is easy enough. The metallic side panels are simple to polish, and the drip tray catches any excess water or coffee which spills. Unfortunately, pods other than those from Nespresso aren’t really suitable. We tried a few other brands, including cheaper ones on the market, and they did not fit securely enough to operate properly. Only ones bought from Magimix are guaranteed if something goes wrong, too. This doesn’t take away from the fact that, if you use the correct recommended pods, the coffee produced is really great quality. If you’re after a capsule machine that is both space- and money-saving, then the Essenza Mini is pretty perfect. This budget offering is easy to use, with two programmable flow-stop buttons, as well as being ultra-compact so great to move around and transport. Take it on holiday, on work trips or simply just store it away thanks to the handle. Available in three colours, there is a style to suit every kitchen. We particularly like the white, as it looks fresh and modern while brightening up any space. It will turn itself off if not used for about 10 minutes, which is great to save energy or if you’re simply forgetful. The coffee produced tastes similar to that from much more expensive models, so it is nice to be able to say that just because it is a lower price doesn’t mean it is lower quality. The crema on the top of the coffee is smooth, just like with a proper coffee shop brew. You aren’t just limited to Nespresso pods either, as a lot of the cheaper non-branded or supermarket own alternatives on the market will fit – you just need to experiment to find the one for you. Nespresso does usually taste better, but alternatives can be great for those in-between times when you’re waiting for an order to arrive. As it is mini, the capacity is the smallest out of those we reviewed, but as pod machines are only made to create one cup at a time, this isn’t a huge issue. It will only really take cups and mugs which are on the small side, though. The drip tray can be removed to accommodate larger sizes, but the machine does drip quite a lot, so this will get a bit messy! The Vertuo range of coffee machines from Nespresso gives you the perfect mix of good coffee and technology, to craft an even better brew with even less effort. There are four pre-programmed cup sizes available at the touch of a button, so you do not need to spend ages trying to get your coffee just right. Thanks to an intelligent extraction system, it also does a lot of the work for you. Nespresso Vertuo’s automatic blend recognition barcode technology will read the pod to adjust the brewing parameters to each blend and capsule size, depending on the particular one you are using. This makes it the best option for anyone who prefers their coffee to not rely on espressos, such as different flavour blends or iced coffees. Simply pop the pod into the holder and pull down the lever. Centrifusion power means it will spin at a rate of 7,000 rotations per minute, so you get the full flavour and a great crema with no hassle. As the water tank is a generous 1.7L, you won’t have to refill it as much as with smaller models, which we think is great for anyone who is often in a rush in the mornings, or even if you like to make coffee for the whole family or one cup in the morning isn’t enough. We also think it is the best option for the office, as the variety of coffee will please everyone. It will only take the Vertuo capsules – the Vertuo and Original pods aren’t interchangeable, and you can’t use cheaper non-brand pods either because of the automatic blend recognition technology. As long as the cost of only being able to buy Vertuo pods is okay with you, then this isn’t an issue. Got a rapidly developing smart home full of technology which can be controlled via your smartphone? Want a coffee machine which will do the same? With the Prodigio, you can brew your coffee straight from your phone if you want it to be ready by the time you get to the kitchen or schedule it ready for when you get home. As long as your smartphone has Bluetooth, it will probably be compatible, no matter what operating system or model you have. Check the schedules, brew remotely, take note of your pod stock and get assistance alerts if you want reminders of when the machine needs cleaning/descaling/maintenance work etc. Don’t panic if you don’t want to use your phone, however, as the backlit buttons also allow you to choose settings directly from the machine’s interface. There are three coffee sizes to pick from – Ristretto, Espresso and Lungo – so the intensity and coffee length is adaptable to your tastes. The drip tray is foldable, so the size of cup you use is also adaptable, from espresso cups to ordinary mugs to tall glasses. Obviously, as it relies on technology this can often be a bit temperamental, and there can be connectivity issues, but as it doesn’t only offer remote control it doesn’t mean the entire machine is rendered useless which is good. It took us a while to connect everything up, but once it was in place the control is smooth and the app is simple to navigate. The coffee produced tastes great, and for the price, you aren’t technically paying much extra for the added technology which is good for anyone who is sceptical of whether they’d use it. No drip technology also means it won’t create an unnecessary mess in the process. If you like your gadgets and appliances to be stylish, then this semi-automatic Artisan model from KitchenAid is perfect. And thankfully, it isn’t a case of style over substance. Yes, there are cheaper options out there which do pretty much the same job. There aren’t any fancy additions to this model; you pop the capsule in, pull the lever and adjust some settings just the same. But if you have other items from KitchenAid, or you want your coffee machine to sit on your countertop and add a bit of something to your decor. The selection dial (rather than separate buttons) also adds a bit of a Vintage feel. Having said there are no fancy additions for the price, we think it does feel a lot more substantial than a lot of the other Nespresso models we reviewed. The water container feels a lot stronger and fits back into the machine without any hassle, and is also easy to clean. The lever was also smooth to pull each time we used it, without the occasional stiffness of other models. The most critical factor for any coffee machine is the taste, and the coffee produced tastes very high-quality (as you’d expect). You can select the amount of water that flows through the pod for an espresso or taller latte/iced coffee – in fact, there are six settings from Ristretto to Lungo. It will only work with Nespresso Grand Cru coffee capsules, but as you have 22 to choose from, we are sure you won’t face many limitations. Bear in mind that if you want to buy the dedicated Aeroccino which goes with the KitchenAid, they are both separate so require two individual plug sockets. Not a big deal, but if you want an all-in-one, there are coffee machines more up to the job. Nespresso’s latest connected machine, to add to the innovativeness of the Prodigio. This coffee machine is perfect for anybody who is frustrated with the fact that coffee machines are never designed to be pushed flat against a wall and leave bench room in front of them. If you are one of those who prefers everything tucked away in corners, then the cutting edge flat-to-the-wall design will fare well. Compatible with the Nespresso app, which is made for iPhones, iPads, and Android, you can create your own personalised coffee varieties and schedule brews, as well as start them remotely. It is also the one-stop shop for ordering new capsules and checking your existing stock. With a built-in Aeroccino3, you can create frothy fresh milk from scratch, opening up the varieties of coffee you can prepare. The magnetic drip tray allows you to use different sizes of cups and glasses, to create four coffee sizes; Ristretto (25ml), Espresso (40ml), Lungo (110ml) and the special Nespresso Americano (25ml coffee and 125ml hot water). There’s also a hot water function if you want something a bit more mellow, or to make a good old cup of tea. Coffee isn’t meant to be drunk at boiling point as it damages the taste, but if you do prefer your brews hotter than most other coffee machines are capable of, there are three temperature settings. You can choose whether to make your cup at medium, hot or extra hot. It was, unfortunately, the most hit-and-miss model we tested, with the occasional failure to pierce the pod and just leak hot water onto the drip tray. This was mostly when we used the buttons on the machine rather than the app, which was annoying but didn’t take away from the fact once it did work, the coffee produced tastes great. Will it be used frequently throughout the day? How many coffee varieties do you want to be able to make? Do you prefer milk-based coffee? All pod machines will only make one cup at a time, but some have larger water tank capacities than others so will need less filling up throughout the day, meaning a bit less hassle and more flow without interruption. Some machines only give you the option for two coffee sizes (espresso and lungo), whereas others give you up to six so could be more suited to coffee connoisseurs or households/workspaces where there is a lot of variety in tastes. Similarly, should you prefer lattes and cappuccinos, you’re going to need a milk frother. While you can purchase an Aeroccino separately and add the milk yourself, it could save a lot of time, effort and money if you get one built-in. 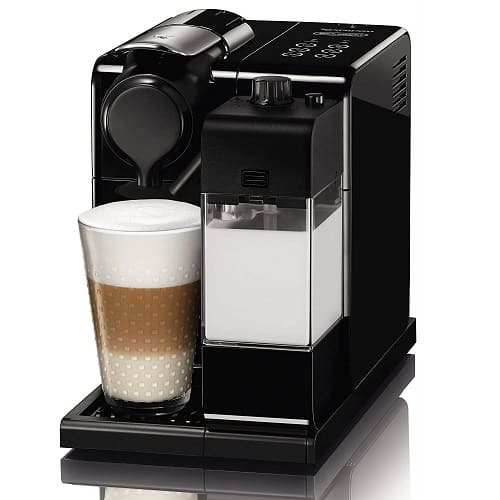 A lot of the varieties of machine we have featured on this page are available both with and without the Aeroccino. Nespresso makes two different varieties of machine – the Original and Vertuo. The big difference is the variety of coffee both make. Original machines are better at making pure espresso-based beverages, with coffee varieties from all around the world. Vertuo is for those who like something a bit different, from iced coffees to vanilla and floral based blends. The Vertuo pods have a barcode on, and the machine reads this to cater the water length and power needed to blend the perfect cup. They’re also available in five different sizes: Alto (414ml), Mug (230ml), Gran Lungo (150ml), Double Espresso (80ml), Espresso (40ml), so technically give the user more options. Only the Original pods can be used in the Original machines, and Vertuo can be used in the Vertuo machines, so do bear this in mind. Vertuo machines also won’t accept third-party pods. There are three Vertuo machines available, and the Plus we have featured is the one we think is the best. The Original range offers more appliances and also more coffee pod choice, but it all boils down to how personalised you like your coffee. This ranges from the entry-level Essenza and Inissia models, up to the Creatista Plus. Unlike with a lot of other appliances, however, more expensive doesn’t necessarily mean better. You need to look at bar pressure when buying a coffee machine to see just how well it will create the perfect cup. All Nespresso machines sit at 19 bar pressure, and as they all use the same pods, the taste of the end product doesn’t necessarily get any better the higher up the price scale you go. The cheap Nespresso machines at £100 or less usually just offer a more limited range of choices when it comes to coffee sizes and personalisation. Most don’t have built-in milk frothers and have smaller water tanks, which isn’t a problem if you will only be making coffee for one or two people. Mid- and high-range pod machines, around £200 or so, are usually a lot more stylish and there may be more milk frothing and temperature options. There may also be a screen or Bluetooth compatibility. It depends whether you see these as essentials, or are happy with a standard cup of coffee.